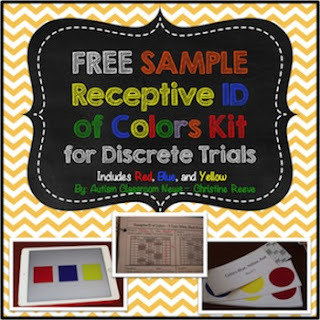 This research-based set of materials is designed to include all the materials needed to teach the receptive identification (i.e., show me blue) of colors using discrete trial training (DTT). The full product includes 9 colors. This sample includes red, blue and yellow as a starting point. It is specifically designed to assure that materials are presented in a consistent manner to the student to avoid errors being made because of where materials are placed or how they are constructed. To do this, the materials are simple and move from less distracters within them (i.e., circles without borders to squares with black borders to stars and crayons that are completely the identified color but have different shadings). This product provides tools for those trained to use discrete trials and is not intended to take the place of training in discrete trials by an experienced professional. The arrays are already constructed so that the instructor just pulls them out and goes through them in order. There are probes included if you use probe data to compare to instructional data. There are instructional and probe data sheets included as well that are easy to use, can be put together for program planning or working with multiple students and then returned to a student-specific program book. Finally the arrays can be used on a tablet or computer so that they don’t have to be printed. If you are short on color ink this is a paper-efficient method of using it. I would recommend printing out the data sheets to provide a visual prompt to the instructor of the order of the instructions as well as to allow him/her to take data. Instructions for how to use the materials with a tablet or computer are included as are instructions for printing. This product is copyrighted to Autism Classroom News - Christine Reeve 2015 for use in one classroom. They may not be copied for additional classes without purchasing extra licenses. For bulk discounts, please email me at drchrisreeve@gmail.com.